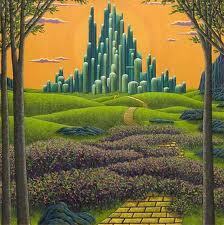 Home State by State News Cannaland…..
It’s been dubbed “Emerald City,” a name as whimsical as the effort, critics say. Emerald City is the fictional capital city of the Land of Oz, featured in books and in the movie “The Wizard of Oz.” And in pot country, emerald can be a reference both to the green of the marijuana plant and the color of money. “It was sort of an irresistible temptation” to call it the Emerald City, said Jim Lamport, the man behind the effort and who owns a legal document service in Garberville. Southern Humboldt County is at the center of the so-called Emerald Triangle, a prime pot production region that also includes Mendocino and Trinity counties. “A lot of people like the name. The people who don’t like it really don’t like it,” Lamport said, adding that the name is just tentative. The effort to create a new city stems from the belief that southern Humboldt County doesn’t get its fair share of county services. “There’s a feeling, shared by quite a few people, that we need a stronger, bigger political voice,” Lamport said. The boundaries of the proposed city have yet to be determined but would include Garberville and Redway, each with just over 1,000 people. The proposal to incorporate is in the early discussion and fundraising phase. Lamport and his group must raise about $7,500 to launch the first step in the process, a financial feasibility study. The feeling that the area is shortchanged on services is widespread, but support for creating a new city is not, said George Rolff, a Garberville real estate broker. “I don’t think most of the old timers would put up with it,” he said. Rolff said he’s like many other residents who moved to the area 40 years ago to escape from cities. “I came up here as a long-haired hippie not wanting any city services,” he said. But he now appreciates having the comforts of PG&E electricity and a flush toilet. Like Lamport, he wants additional services, or to at least keep what they have. County budget cuts are threatening to eliminate Garberville’s sheriff’s substation, Rolff said. But he doesn’t believe there is sufficient income from the area’s hotels and other businesses to support city services. “I personally don’t believe it pencils out,” Rolff said. Humboldt County Supervisor Mark Lovelace said he supports exploring the idea but expressed doubts about its feasibility. Lamport said the city potentially could reap new income by taxing its top crop, marijuana, in addition to other business taxes. It’s an issue increasingly being investigated by cash-strapped counties and cities. “There is a potential source there,” he said. This is not the first time Lamport has attempted to adjust his county’s boundaries. He led a failed effort 15 years ago to create a new county — Sequoia — that would have included southern Humboldt County and northern Mendocino County. The initiative failed to garner sufficient signatures to place it on the ballot. Next articleWA medical mj debacle…..